Sometimes it’s healthy to realise you have enough going on in your life to not add any more complications, and sometimes it’s a great idea to challenge yourself a little. This month, I’m being challenged; and it’s proving tough. I’m a good(ish) swimmer. I never mastered butterfly, but I can hold my own in frontcrawl, breaststroke, and backcrawl; I once swam a mile in Lake Windermere to raise money for charity; I used to swim on various school teams. But that’s as far as I go. A few weeks ago, Mr T’s brother (T3) told me he was thinking about swimming the Channel. ‘The Channel?’ I replied. ‘The actual Channel?’ I was reassured that ‘no’, not the actual Channel, but in fact, 22 miles in a swimming pool spread out over the period of three months. Now I know I could NEVER swim the Channel. There are many reasons for this. Number one, big bodies of open water scare me; if I can’t see the bottom, I begin to have issues. Number two, sharks; don’t try to tell me they don’t come into the Channel because I know they do, ok? Number three, continuously swimming for 22 hours would probably kill me and I’m not that strong. So, the actual Channel aside, I thought this sounded like a pretty cool challenge, except, in my infinite wisdom (and arrogance?…) I decided I’d do it in a month. So this means swimming a mile Monday to Friday in my local pool, which takes me about 45 minutes. I’m on Day Four, and I’m tired. So very tired. I also carry a lingering scent of chlorine. 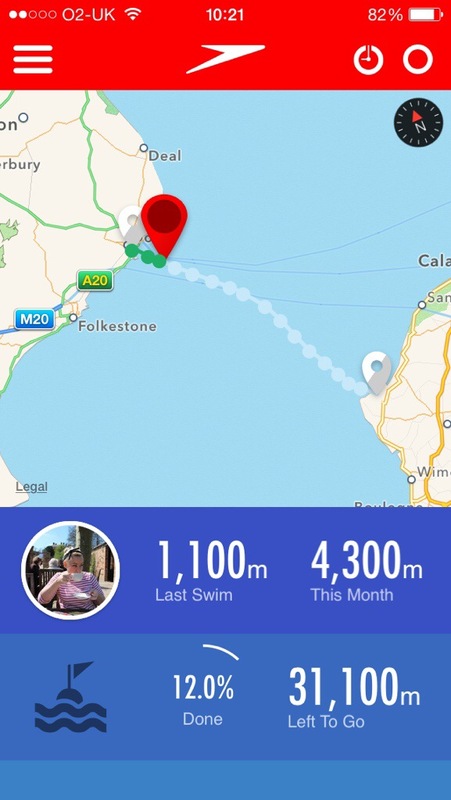 One of the things keeping me going is this awesome app from Speedo where you can log in your challenge, and then it shows you your progress in the actual Channel; admittedly at the moment I’m bobbing depressingly close to Dover still, but I’ll get there! Was it a great idea to challenge myself? Who knows, but I do know it’s going to be a very tough month! ← City Guides – Do you want to share your city? Most impressed! You can do it………. Aw, what a lovely idea! Keep it up; you will get there! …And what you do, then treat yourself to a weekend in Paris by Eurostar. No shark fear, and also you can bring your purchases home with you without them getting soggy! Thanks, love. I’ll hint to Mr T to whisk me away to Paris; hopefully he’ll get the message!